With rare exceptions (before the '70s), horror films were pretty much in the league of their drive-in B-movie Sci-Fi counterparts, being low budget filler fodder. In 1968 Pittsburgh based commercial moviemaker George Romero rewrote the horror book with his production of this classic black & white zombie flick. At a time of hippie disillusion, the impending Vietnam War and a film industry taking new daring chances, he transcended the mere visceral thrill with underlying political layers. The basic survival plot of a group of strangers holed up together in a farmhouse, trying to keep the (inexplicable) risen dead from getting to them, escalates to a struggle amid themselves. With its dark tone and classic scary movie elements, this time round the believability factor was stepped up way high, elevating it from a mere silly shriek-fest in the Herschell Gordon Lewis vein. With a very low budget, Romero managed to concentrate his drama and tension successfully in the one location, adding the physical horror to the psychological trauma. On top of this he made the brave choice of a black actor as his lead, with most performances (including the zombies) pretty good. Of course the film also features one of the coolest graveyard opening scenes. 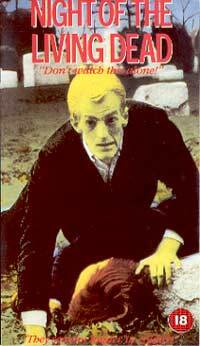 The movie was also released in a colourized version - avoid it or turn the colour down on your TV. 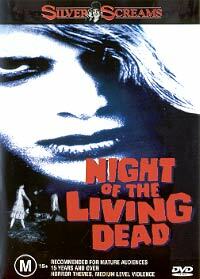 Romero's future make-up FX partner Tom Savini's directorial debut was with the 1990 remake of this classic zombie-flick.